The Jabra Pro 935 is an office headset any business would be happy to deploy. It allows you to get on with your job with the simplicity and freedom you'd expect of a wireless headset. 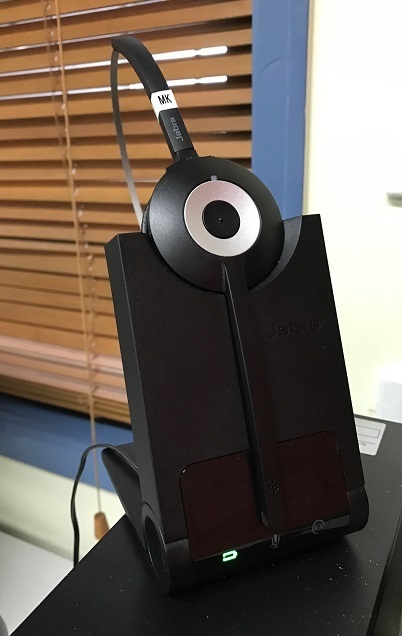 We recently undertook a project to upgrade our entire Service Desk to use the Jabra Pro 935. The feedback from the team? The quality is there and they’re discovering new ways it can improve their day-to-day work. The one stand-out feature they all pointed out? Wireless range. The Pro 935's features result in real benefits for our own clients. It’s reduced the number of occasions they have to wait due to an engineer being away from their desk. Or waiting for an engineer to get a second opinion. Before the deployment, none of the team had previously used Jabra headsets for calls but all have been impressed. Comfort is always a critical issue for long-use headsets and so often even expensive models are lacking. We had great feedback praising both the ergonomics and the quality of the Jabra Pro 935. But the key question is whether the move to the new headsets was worthwhile? "A big improvement". Adam again pointed how no longer feels restricted at his desk. But he did note there was room for improvement with the headsets. He found the earpiece itself would occasionally interfere with the frames on his glasses. An issue worth considering but one that can be easily tested with a trial device before a wider deployment. For many of the Service Desk team, they're now considering Jabra for their next personal headset purchase. For Sentrian, the Jabra range will be out go-to for headsets in the future. One feature we're going to be looking out for is a call indicator light on the headset itself. Our engineers like being able to walk around on a call but occasionally people will try engage a conversation when they're on a call. Jabra do offer a busy indicator however it is a separate device tied to a desk. If you'd like to know more about the Jabra range, or how the Pro 935 may benefit your office, contact your Sentrian Client Services Manager today.